Whoever said, “Location, location, location” is the key to success obviously never set foot inside Racha Noodle. Housed in a forgettable mini strip mall where California Street careens into South Market, this first restaurant opening by five Thai sisters (who also operate 5 Thais on Dana Drive) defies modern business models and has been turning out their delightful dishes to a hungry budget-conscious and appreciative crowd for four years. Racha’s interior is painted an odd but pleasing lilac color; simple décor includes Thai tourism posters and pictures of Thai food. There are about a dozen tables so it can fill up fast, especially during prime lunch and dinner hours. Go during off-peak hours if you want to avoid feeling crowded. Amico del Signore adding bean sprouts to beef pho with shrimp, tripe, meatballs, and tendons. $7.50. Racha is a great place to get your fix of pho, that warming meat-and-noodle dish that until the last few years was well-nigh impossible to find locally. 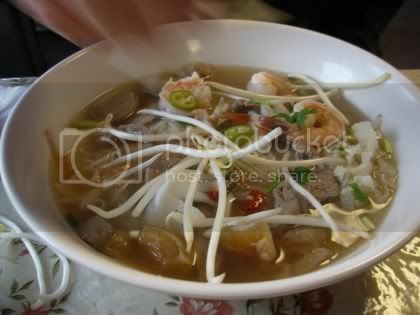 Generous bowls of hot soup come with a small plate of bean sprouts and lime wedges to add to the soup as you prefer. There’s also a tray of typical Thai condiments available, such as pickled hot peppers, ground dried chilis, Sriracha, sugar, etc. See http://www.madammam.com/articles/tabletop.html for a clearer explanation of how to use them. Note: when adding hot condiments to a dish, be aware of the accumulative effect. More than once M. de Joie has gleefully piled on Jalapenos, Sriracha, and so on, only to find the resulting broth explosively hot. Having eaten pho at several restaurants in Redding, it’s Femme de Joie’s opinion that the rich broth makes Racha’s version the best local version she’s tasted so far. In addition to beef and shrimp, versions with seafood only, beef only and chicken are available. When you’re coming down with a cold, feeling wet and chilled, or just need some comfort food, pho will get you set on the right track again. 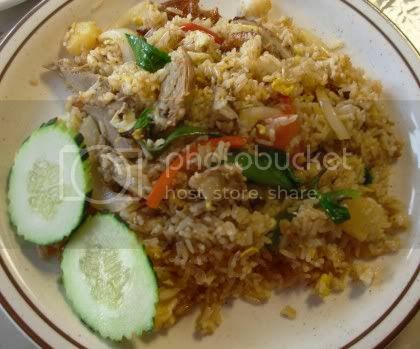 The duck fried rice ($7.95) was a much less salty and more flavorful version than is found in Chinese restaurants. Packed with duck, bits of pineapple, fresh herbs and vegetables, this makes a great accompaniment to curry or a simple lunch by itself. 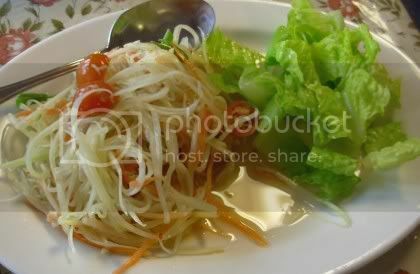 Green papaya salad with spicy lime dressing, $6.65. Green papayas are quite a different animal from the soft musky-scented ripe sweet papaya. Here at Racha, it makes a tart and spicy slaw-like salad that cuts the richness of dishes like pumpkin curries and salmon dishes - or a light lunch. Warning: papaya (along with several other fruits/vegetables) can trigger allergic reactions in people who are allergic to latex; see http://allergies.about.com/od/medicationallergies/a/latexfood.htm for more information. 5 spice chicken leg soup, $5.95 as daily special. This unusual dish is a lighter kissing cousin to pho. 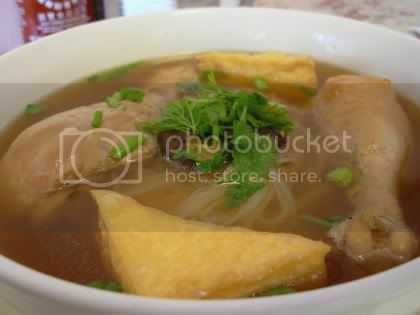 Two tender and flavorful chicken legs poach in a 5-spice broth, along with large wedges of fried tofu, rice noodles, scallions, cilantro and mushrooms. Eating chicken legs in soup posed an interesting etiquette dilemma since no knife and fork were provided. M. de Joie finally decided to pick the legs up and eat them out of hand - a messy but satisfactory solution. Though not pictured, M. de Joie strongly recommends the garlic chicken, which will tempt you to pick your plate up and lick it, and the mango with sticky rice dessert, which will cause you to squabble with your dining partner. It’s that good. About that business model: in addition to its off-the-beaten-path location, Racha Noodle only accepts cash. No checks, no debit cards, no credit cards. But Racha Noodle is worth making a stop at the ATM for, and you won’t have to withdraw very much money. This is a great local place. Racha Noodle, 2630 South Market Street at California Street, Redding, CA 96001. 530-246-8730. Open Monday-Saturday 11 AM-3 PM and 5 PM-8PM. Closed Sunday. On-site parking. Vegetarian and vegan options. No alcohol. Cash only. No cards, no checks.